The Gatwick Express train service, which was threatened with closure, is to remain but the franchise will change in May next year. The London to Gatwick airport route, used by millions of travellers, could have been closed under rail plans. 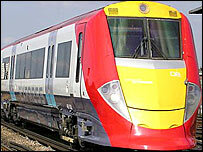 But the franchise will transfer from National Express to Govia-owned Southern in May 2008. 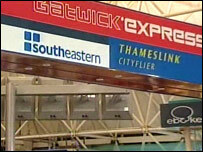 The Department of Transport said the service will run beyond Gatwick to Brighton at the busiest times of day. That would double the number of express trains between Brighton and London at peak times. Extra trains will be provided by taking unused coaches out of storage. At least two extra trains will also run between Redhill, Surrey, and London at peak times. The service changes will be implemented in December 2008, the government said. The franchise was due to expire in 2011, but a "no-fault termination clause" is being used to bring in the changes. An extra 48 carriages are also to be added to the Thameslink route, which runs from Bedford to Brighton through central London, by December 2008. "This is good news for both rail and air passengers," said transport secretary Douglas Alexander. "We are adding more seats and more trains on some of the country's busiest rail routes. "The need to increase capacity is a real challenge facing the railway industry and it is a priority for my department." Passenger group London TravelWatch said it welcomed the extra carriages to tackle overcrowding on Thameslink. "However, it is a real shame that this will take to the end of next year to achieve," said spokesman Brian Cooke. "The precise benefits for passengers are still unclear - it will depend on the detail of the proposed timetable changes. "We want to see improvement in the off-peak local services between Purley and Gatwick. "This route has seen a reduction in service over recent years, despite a steadily increased demand. "We have discussed this many times with Southern, and we ask them, and Network Rail, to find a solution to this as soon as possible."